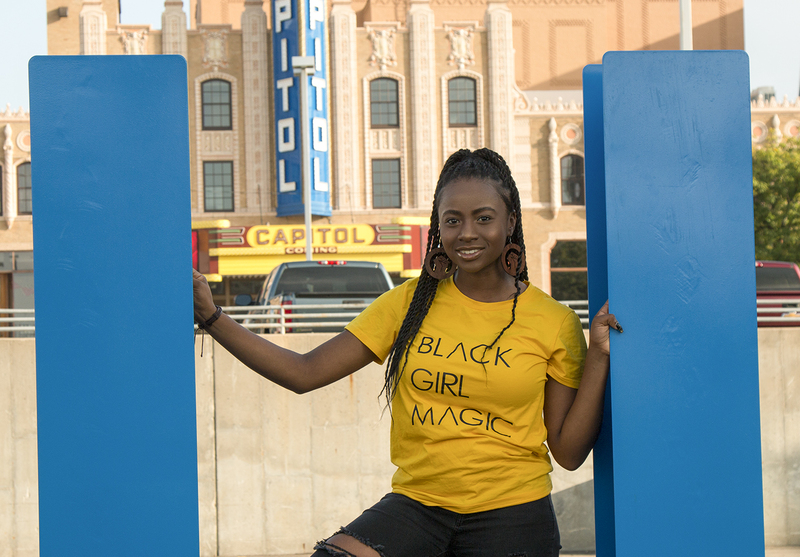 For Kayla Shannon — one of two Flint-area students to medal this summer at the NAACP’s national ACT-SO (Afro-Academic, Cultural, Technological, and Scientific Olympics) competition in San Antonio, Texas — spoken-word poetry is more than an artistic outlet. It is a platform for justice. Now a 17-year-old high school junior, Shannon has had the good fortune to perform her works in Chicago, Atlanta and San Francisco as a member of Raise It Up! Youth Arts & Awareness. Founded by Natasha Jackson-Thomas and Lyndava Williams, Raise It Up! uses arts activities and dialogue to address issues critical to Flint’s young people. “I’ve been writing poetry since I was 8 or 9 years old,” said Shannon, who plans to major in sociology or political science in college. But poetry, like nothing else, she said, has been a way to express “that side of the world that saddens me.” In joining Raise It Up!, she was able to explore and learn more about injustice in the U.S. and around the world. And she came to realize that, through her poetry, she had a platform to make other people aware of oppression. It was through the contacts made while performing with Raise It Up! that she learned about the national ACT-SO competition. With just 10 minutes to get to the competition, Shannon used the short drive to the venue to figure out what she would perform. Shannon, along with Ashton Edwards, a young dancer with the Flint Institute of Music’s School of Performing Arts, qualified for the national competition. “Kayla was an eleventh-hour walk-in, but she absolutely blew the judges away,” said Ella Greene-Moton, who joined the local branch of the NAACP as ACT-SO Chair almost 20 years ago. Flint is one of more than 200 communities throughout the United States to offer ACT-SO, an achievement program designed to recruit, stimulate, and encourage academic and cultural achievement among African-American high school students. Past ACT-SO winners include such notables as Alicia Keys, Jennifer Hudson and Jada Pinkett-Smith. The Charles Stewart Mott Foundation has granted $300,000 in multi-year support for ACT-SO’s national and Flint-based programming. But even more than the chance to perform, it’s the friendships and mutual support among ACT-SO participants that add the greatest value to the program, continued Greene-Moton. With the help of the Mott grant, she is working to strengthen ACT-SO in Flint and include culinary arts as both a category for competition and preparation for a potential career. As finalists, Shannon’s and Edward’s travel and lodging expenses were covered by the Flint Branch of the NAACP. Although she planned to perform Kryptonite, Shannon was forced to make some last-minute adjustments to shorten her work to 3 minutes. Her practice paid off. Shannon surpassed her goal, earning a silver medal, which came with a $1,000 college scholarship and an iPad©. Edwards also placed in the Dance-Ballet category, receiving a bronze medal. While it was an immense honor to win, the friendship and support she received while participating in the national ACT-SO competition was equally rewarding, said Shannon.